A carer who attempted to murder a 90-year-old grandmother in her own home by hitting her with a hammer and stabbing her in the neck has been jailed. 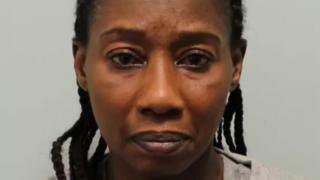 Abosede Adeyinka, 52, of Hayman Crescent, Hayes, attacked her elderly victim in West Drayton on 27 April. The woman suffered a skull fracture and a serious neck wound. Police said the motive for the "vile and disgusting" attack was theft. Adeyinka was sentenced to 21 years in prison at Blackfriars Crown Court. Investigators discovered how Adeyinka had built up a relationship with the victim after she previously provided private care at the address. Adeyinka continued to visit the victim and was familiar with her weekly routine. On the evening of the assault, Adeyinka went to the house with her face covered as a disguise. She then pushed the victim to the floor and pulled a medical alert button from her neck before striking the victim twice over the head with the hammer and stabbing her. The victim managed to pull the knife out of her neck and throw it back towards her. Adeyinka left the property after being told the victim's son was on his way. She was arrested the next day. She denied attempted murder at trial but was later convicted by a jury. Det Con James Harbour said the attack was a "vile and disgusting crime on a defenceless grandmother in her own home". "There are so many factors that make this a wicked attack, including a victim who was 90 and the level of violence used", he said. "In view of the age of the victim and brutality of the attack I am truly thankful that the victim has been able to recover. "It is a credit to her that she was able to attend the trial in person and tell the court what had happened to her."